Whitesnake will release a series of 35th anniversary reissues of their 1984 classic, “Slide It In”, on March 8. The group’s sixth album delivered their fourth UK Top 10 set and their commercial breakthrough in the US thanks to singles like "Slow an' Easy", "Love Ain't No Stranger", and the title track. A 2019 remaster of the “Slide It In” will be available in all versions, including a 6CD/DVD Ultimate Special Edition, a 2CD Deluxe Edition featuring US and UK mixes plus bonus tracks, a single CD (US Mix), and a 2LP vinyl edition. The 6CD/DVD Ultimate Special Edition (see full track list below) presents the US and UK mixes of the album, as well as unreleased studio recordings – including previously-unavailable versions of all songs on the original album plus monitor mixes, and brand new 35th anniversary remixes. The package also features an entire 1984 Glasgow concert performance and live performance tracks from Jon Lord’s final show with the band, a 60-page hardbound book including photos, essays, notes, and credits, and a DVD of promo videos, live footage, and an interview with David Coverdale. The 2CD Deluxe Edition also includes the US and UK mixes plus bonus tracks, as outlined. “’Slide It In’ was always meant to be a structured, more electric modern take on the classic blues-based hard rock that Whitesnake were famous for,” says Coverdale, “but our new Hook City Hooligan, Mixer Extraordinaire Christopher Collier, has hand-tooled this classic record for the 21st century. Hearing all the performances so fresh and so clear after 35 years was amazing. Mel, Cozy and Jon’s playing on the record is as vital now as it was all those years ago. All the featured players shine. 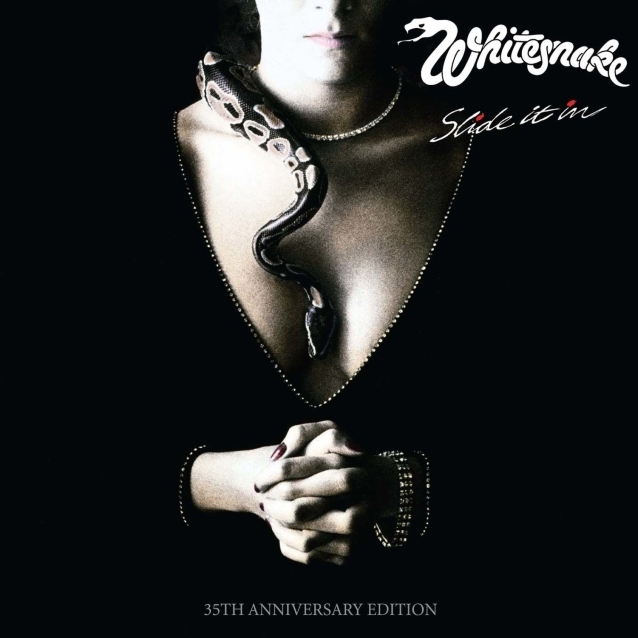 As Whitesnake scored massive US success with their self-titled 1987 record, “Slide It In” returned to the charts Stateside on its way to double-platinum status for sales of more than 2 million copies in the country.